With all of the accusations which you are throwing around concerning uranium one...do you have any actual factual paperwork from either departments of our government or any intelligence agencies. Or is this he said, she said, they reported, we presume, we heard, they said, and are they credible sources? @williamb39198, Consider researching Douglas Campbell and his testimony this past week. The investigation is still in progress. More information will be available as the DOJ comes to a conclusion. There is a lot of very interesting information coming from Mr. Cambell. Or how about the Canadian, British or French governments paperwork? Then isn't it about time they put all this out there and let the legitimate media check the facts? I totally agree. Or better, let us see it and not depend on any media interpretation. But everyone who watches Fox has already lost too many brain cells to perform rational analysis of anything as proven by the last election. Now there is an intelligent idea - "You don't agree with me so you must have lost brain cells. Just so others don't forget, Uranium One involved production capacity THAT HAD BEEN IDLE FOR DECADES, plus some Canadian ore deposits, the uranium from which could not be exported to Russia without additional approvals from the Canadian Government. So what is your claim - Hillary scammed the Russians? We already have enough nuclear material to fuel all the power plants we'll ever build as does Russia and the easiest component from existing bombs that can be recycled into new bombs is the fissile material. In short, no actual capacity to refine Uranium was lost in the deal nor was any actual uranium. Again - she scammed the Russians? People who think there's something worth their attention in this are people who only want to hear bad stuff about Hillary and Obama because there's too much actual good stuff about both of them and nothing good to hear about Der Trumper, just like there is still nothing good to hear about jrbush and a great deal of good stuff about the actual winner of the 2000 election, Al Gore. Right, Gore won that one and Hillary won this one. Time to check your brain cells. In 2010, the Obama administration granted approval to Russia’s atomic agency, Rosatom, to acquire a majority stake in Uranium One. The deal was controversial because the Canadian mining company at the time controlled 20 percent of all uranium mining capacity in the United States. Given the national security implications, the deal required approval by the Committee on Foreign Investment in the United States (CFIUS), which included the State Department, then headed by Hillary Clinton. Russia had well announced its plans to corner the global uranium market as a way to exert political control over other countries. As early as 2006, Russia announced it would spend $10 billion to grow Russia’s global uranium production capacity by 600 percent. Uranium is a key component for nuclear weapons as well as nuclear energy. A July 2011 report from the U.S. Energy Information Administration revealed that American nuclear power plants relied on imports for 92 percent of their uranium supply. Twenty-three percent was imported from Russia. So why did President Barack Obama and the State Department headed by Hillary Clinton approve the deal that weakened America’s security and energy independence? 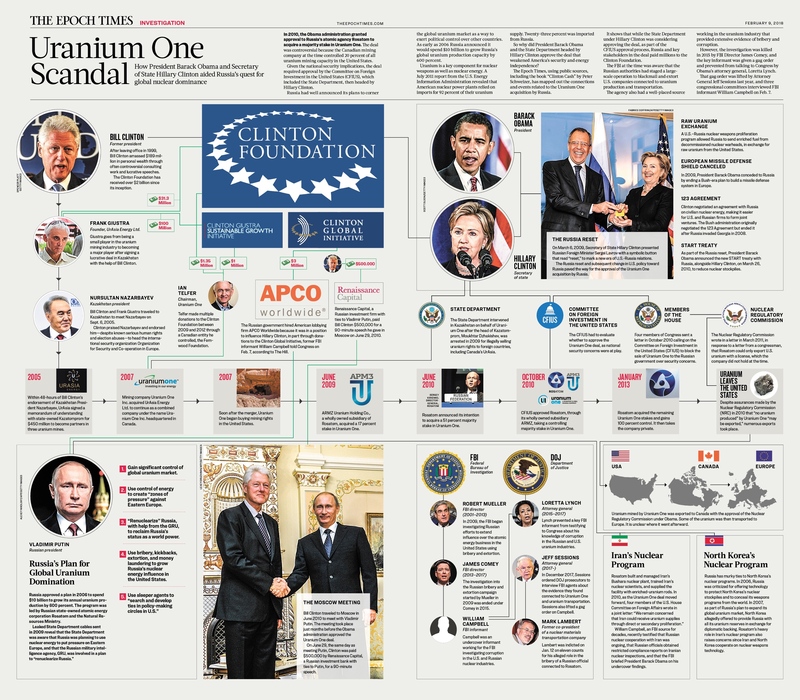 The Epoch Times, using public sources, including the book “Clinton Cash” by Peter Schweizer, has mapped out the connections and events related to the Uranium One acquisition by Russia. It shows that while the State Department under Hillary Clinton was considering approving the deal, as part of the CFIUS approval process, Russia and key stakeholders in the deal paid millions to the Clinton Foundation. Bill Clinton himself traveled to Moscow just months before the deal was approved to meet with Vladimir Putin. Clinton was also paid $500,000 for a speech he gave in Moscow by Renaissance Capital, an investment firm with an interest in the Uranium One deal and ties to Putin. The FBI at the time was aware that the Russian authorities had staged a large-scale operation to blackmail and extort U.S. companies connected to uranium production and transportation. The agency also had a well-placed source working in the uranium industry that provided extensive evidence of bribery and corruption. However, the investigation was killed in 2015 by FBI Director James Comey, and the key informant was given a gag order and prevented from talking to Congress by Obama’s attorney general, Loretta Lynch. That gag order was lifted by Attorney General Jeff Sessions last year, and three congressional committees interviewed FBI informant William Campbell on Feb. 7. He revealed how the Russian government used an American lobbying firm, APCO, to funnel millions of dollars to the Clinton Foundation’s Global Initiative, The Hill reported on Feb. 7. In December, Attorney General Jeff Sessions had announced it is revisiting evidence obtained by the FBI in an investigation into the Uranium One Deal. On Jan. 12, the DOJ unsealed an 11-count indictment of a former co-president of a Maryland-based transportation company for his alleged role in the bribery of a Russian official connected to Russia’s State Atomic Energy Corporation.